Galerie Durand-Ruel, Paris (acquired from the artist in February 1892). M. Sanmarcelli, Paris; sale, Htel Drouot, Paris, 22 April 1895, lot 61. Mr. and Mrs. Wilber L. Cummings, Greenwich; sale, Parke-Bernet Galleries, Inc., New York, 1 April 1942, lot 39 (illustrated). Dr. Albert Blum, New Jersey (acquired at the above sale). Margaret and Sydney Lowy, Baltimore; sale, Sotheby's, New York, 9 May 1989, lot 21. L. R. Pissarro and L. Venturi, Camille Pissarro, son art-son oeuvre, Paris, 1939, vol. I, p. 189, no. 768; vol. II, pl. 159 (illustrated). Paris, Galerie Durand-Ruel, Exposition Camille Pissarro, February 1892, no. 42 (as Soleil couchant avec brouillard). Jerusalem, Israel Museum, Camille Pissarro, October 1994-January 1995. After choosing what would become his home for the next twenty years, Camille Pissarro wrote to his son Lucien in March 1884, "Yes, we have decided for Eragny on the Epte [near Gisors]. The house is wonderful... with garden and fields. It is about two hours from Paris. I found the country much more beautiful than Compigne,... But here comes the spring, the fields are green, outlines are delicate in the distance..." (J. Rewald, Camille Pissarro, Letters to his son Lucien, London, 1980, p. 58). 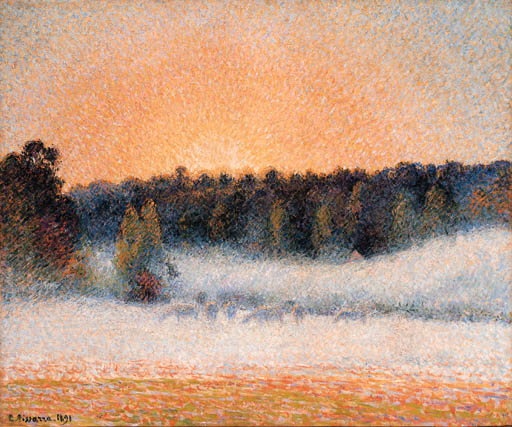 Pissarro translated atmospheric effects on the local landscapes into brilliant juxtapositions of color, exemplified by Soleil couchant et brouillard Eragny. In this work, the sunset fills the sky with vibrant shades of yellow, highlighted by touches of red and blue, while the herd of cows grazing in the distance are enveloped and softened by the low lying pink and violet haze. An explosion of short brushstrokes fill the canvas with a tightly woven, undulating texture. "The rural paintings dating from the 1890s retain a luminosity of texture that is derived from the close working of the surfaces of his neo-impressionist paintings. There is an intensity about these paintings representing Eragny-sur-Epte that enriches them with an almost visionary quality" (C. Lloyd and A. Distel, Camille Pissarro, Haywood Gallery, London, 1981, p. 134).